The Super Secret Project revealed! Ok, so it wasn’t a total surprise. My sister figured out the surprise was for her BUT she didn’t know exactly what it was. 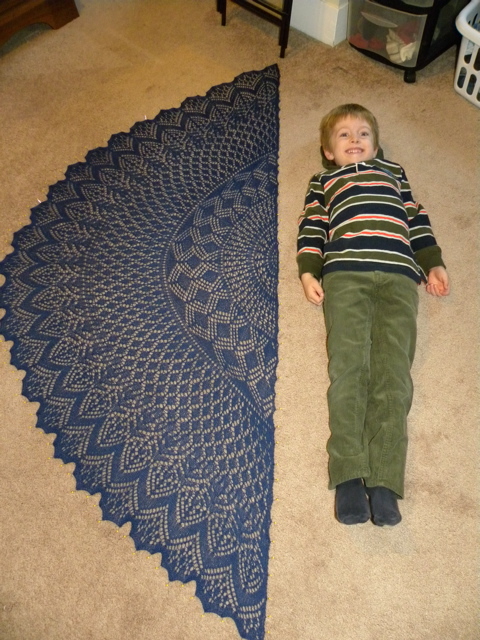 And what it was, my friends, was the Vernal Equinox Shawl and the free pattern can be found here. As you will see in this picture, I tried blocking it with 2 different edgings, to see which I preferred. One side has the pointy edging, and the other has the more scalloped edging. I decided I liked the scalloped edging best, so I reblocked the pointy side. Oh, and I chose to knit the edging with 3 or 4 rows of garter stitch. Most people on Ravelry seemed to use the crochet edging…but I can’t crochet, and I think I like the look of mine better anyways. Below you can see it with a 4 year old cutie beside it. That gives you a good idea of the size. 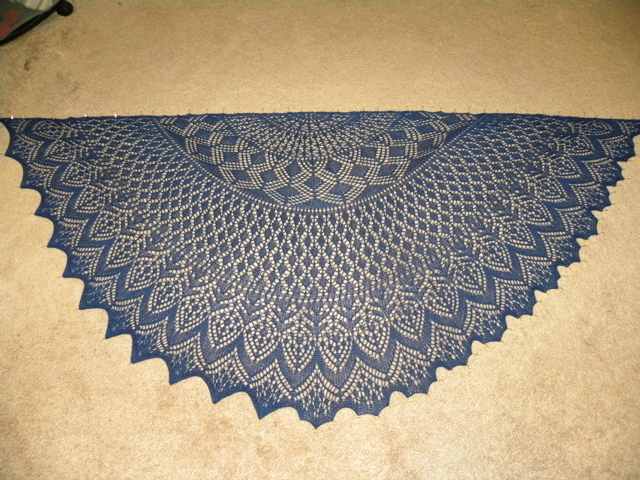 I started the shawl in August and I finished it a few days ago, but I didn’t work on it every day…in fact, there were whole weeks I didn’t touch it. I used Cascade Yarns Heritage Silk…which was a wool and silk blend. 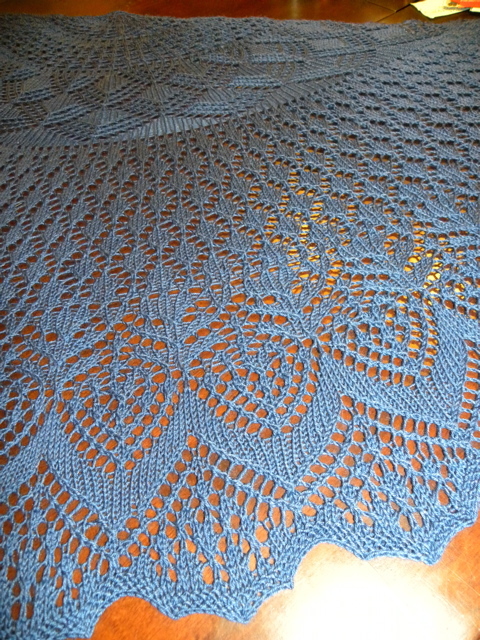 The yarn was very nice to work with and had a nice drape and feel to it. I’d definitely consider using it again. 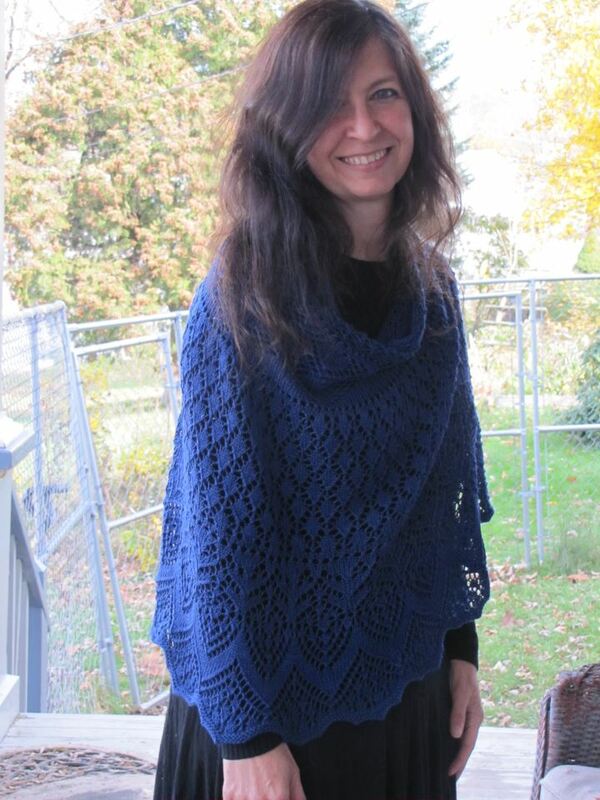 I gave the shawl to Shelly on Saturday, when I traveled to NY to take a dye class with her. It’s her Christmas gift, but in this family, none of us can ever wait so Christmas gifts often come early. 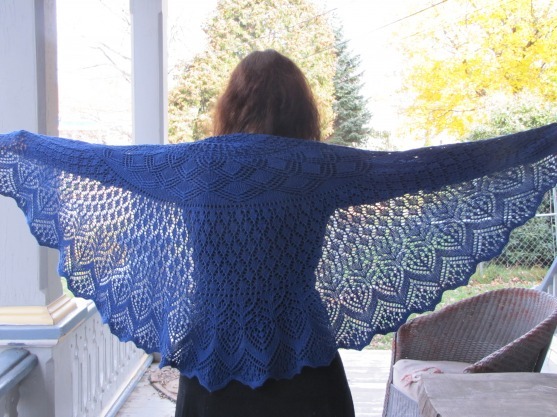 I took pictures of her in the shawl, but her pictures came out way better than mine, so I’m stealing hers to show you. Oh, and yes, she did love it. She blogs about it on her own blog here. It is the most beautiful thing I own – worthy of creating an entire new garb outfit around so it can go to Faire. I love you sooooo much Sis. Thank you sooooo much. You really did not have to do that – but I am so glad you did. 🙂 The only reason I guessed it was for me was that the pattern suggested a shawl and we all know I am the only person in the family who even wears shawls – plus it was in a deep blue – which I wear all the time – plus I am the only person who is always on your blog – because we do this together – that you would have to keep it a super secret. Who knew we would end up having this much fun together when we got older. I love you, I love you, I love you.